Diamond Capsules are extremely user friendly and cost effective .A real alternative to posterior composites and amalgam, they are extremely tough, durable and resistant to edge chipping. After 6 months they develop a compressive strength of 350MPa and can be used to perform non-load bearing class I and II restorations, together with deciduous teeth, the sandwich technique and core build-ups. 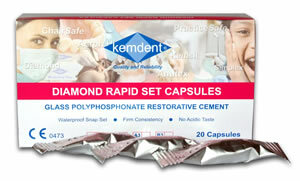 The pre-dosed Diamond Rapid Set Capsules are packed in individual, easy to access foils. The chemical snap set renders the material resistant to saliva and moisture almost immediately. It adheres to both enamel and dentine without the need for preparation of the tooth surface or light curing, ideal for use when speed and reliability is of essence. Chemical curing, without dimensional change, means Diamond restorations can be placed in one increment, saving time and avoiding the creation of stresses within the restoration that can be caused by incremental build-up using composites. Both of these advantages also contribute to its relative lack of post-operative sensitivity compared with bonded composites. Fluoride release is another significant advantage. Diamond is also far less susceptible to moisture around the operating site, partly due to its rapid chemical snap-set and its healthier, mercury-free composition. It quite categorically adheres to both enamel and dentine, without the need for acid etching – saving time and additional expense. And finally Diamond is radiopaque and there is no polymerisation shrinkage and consequent cracking. Working time from start of mix: at 22 - 24°C 2 minutes 15 seconds. Step 1. Diamond Rapid Capsules must be activated for a minimum of 10 seconds before you can use them. When you activate a capsule you are adding the liquid to the powder. Place the capsule in the activator clamping device and clamp the capsule saddle to release the liquid, ensuring that the capsule top does not turn clockwise at this stage. Step 2. Fix the activated capsule in a capsule mixer and mix for approximately 5 - 10 seconds at ~3000 rpm. Step 3. You must open the capsule by twisting the dispensing nozzle through 180° before you can dispense the mixed material. Step 4. Fix the mixed capsule into the gun. Place the Cement Capsule material directly into the prepared cavity, adjusting the capsule direction as required.